Held at RILEY STREET ART SUPPLY- Maxwell Ct., Santa Rosa. SATURDAY, APRIL 27TH, 9:30-3:00 PM. 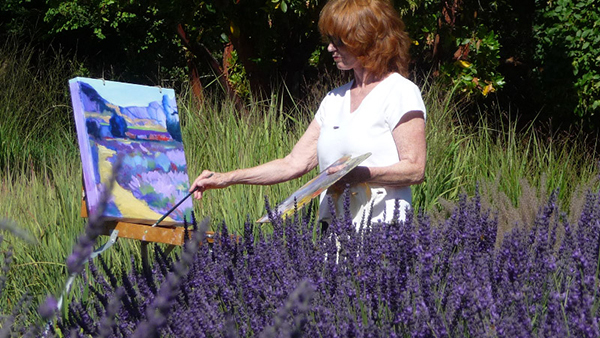 "PAINTING FLOWERS IN THE IMPRESSIONIST STYLE." acrylic or oils." SUNDAY, MAY 19TH, 9:30-3:00 PM, held at Spring Lake Park, Santa Rosa. - with watercolor and simple drawing supplies. Local Sonoma County artists are having a holiday art fair on Main Street in downtown Sebastopol. There will be a selection of pottery, paintings, photography and fiber art. A fair for locals by locals. A wide range of prices to meet everyone's holiday budget. Come to the artist reception on December 8th and meet the artist, enjoy food, music and beverages. Support local artist this holiday season. 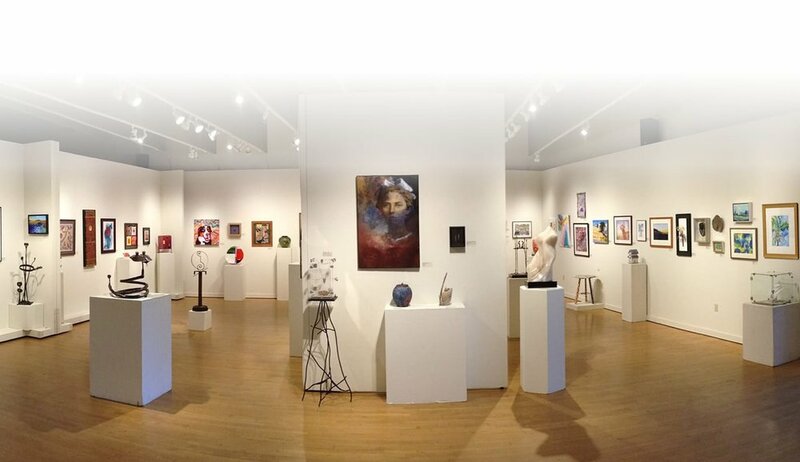 An annual, non-juried event, the Member’s Show continues to shine. Experience the breadth of talent and creativity amongst fellow SCA members! Entry/Submission Deadline: Wednesday, December 5, 2018 between 3-6 pm. Also guest artist .Laura Mueller and Francesca Scalpi Janet Doto and Don Kuhn. At the Artisans' Co-op in the town of Bodega we will be celebrating traditional jewelry making techniques. Techniques such as fabrication, casting, etching, and forging, to create one of a kind pieces. Some of our jewelers do metal fabrication, enameling and up-cycled jewelry made from vintage flatware. Imagine jewelry from items found in nature like; sand dollars and other shells, pearls, pine cones, stones crystals and drift wood. There will be demonstrations, a gallery wide sale and a free raffle. Artisans' Co-op Showcase: Glass, Photography & Wood. Our Artisans will be demonstrating and sharing their craft. Art glass can be created in a multitude of shapes and can incorporate color through a wide range of techniques. Wooden Boxes made from all recycled or up cycled material. Bird houses and hand turned bowls made of wood. See the tools used to capture a bird in flight. Explore the viewpoint of our photographers. Free raffle. Meet the Artist Reception. A Gallery wide Sale with 10% off all art. Photographer Francesca Scalpi will be demonstrating equipment used to capture birds in flight. Art @ The Source will be on June 2–3 and 9–10, 2018. The Artisans' Co-op Gallery features a surprising and wide variety of dedicated painters. Their work represents the full range of painting mediums, techniques, subjects and styles. Gallery visitors will find classic to experimental to whimsical watercolor, acrylic, oil, pastel, colored pencil. ink and collage paintings. Whether you are seeking framed or matted art, or prints and note cards, they await your visit to the Gallery. Carol Covey - Watercolor, Annie Murphy Springer - Watercolor, Carolyn Jarvis - Oil on canvas, Christine McNamara - Watercolor/collage, Liz Stafford - Painter, Sam Sirdofsky - rocks & canvas paintings. Located in the quaint town of Bodega in Sonoma County. We have assembled work from over 50 local artisans. Each artisan is juried in to ensure a high level of quality and expertise in their particular craft. 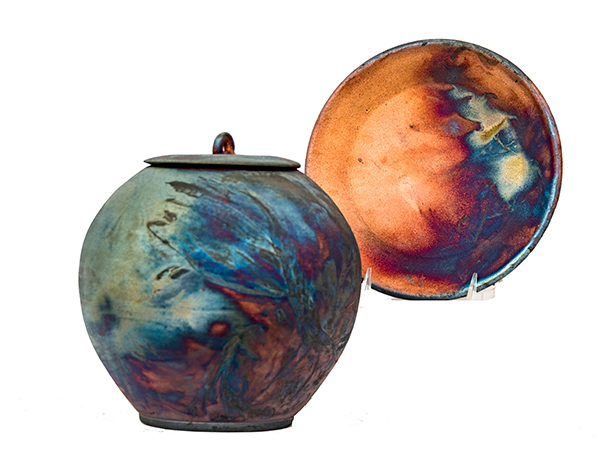 As ceramic artists, each of us utilizes different clay bodies, glaze applications, and firing techniques. Some of the pieces available are hand built, stamped, and molded. Our other ceramicists work at the potter’s wheel, and throw bowls, vases, plates, mugs, and dishes. Demonstrations will include work on a potters wheel and molded techniques. A gallery sale will include pottery seconds at 50% Off. Free raffle. Meet our potters reception with food and beverages. Sale 11am to 5pm. Demonstrations 1pm to 3pm. Reception 4pm to 6pm. Cobbling, spinning, knitting, crocheting weaving, felting and sewing exhibit the range of Fiber Arts practiced by Artisans’ Co-Op members. Each has her own palate of colors and textures. Locally grown wool and yarn for spinners and knitters, and many knitted, woven and sewn garments are all featured in the gallery. Demonstrations will include spinning, felting and weaving, and some items will be on sale at reduced prices. Meet our fiber artists at a reception and enjoy food and beverages. Sale 11am to 5pm. Demonstrations 1pm to 3pm. Reception 3pm to 5pm. The Nature's Wonderland Group Exhibition is at the Person Senior Wing in the Finley Center Complex. Art is in the glass case on the first floor and on the walls of the second floor. Exhibition will be on display until January, 4th, 2018. Libby Kirk is a wonderful glass artist. Her work is also on display and for sale at the Artisans' Co-op in Bodega. Diane Toso's paintings and color palette. Renee Morris's beautiful and whimsical butterflies on paper are magical. Francesca Scalpi's wildlife portraits of owls, spring hare and bald eagles are on display. This show is the annual “family reunion”. On Tuesday December 5, every SCA member is invited to submit one piece of art to the 2017 Member Show. No juror! Your work will guaranteed be displayed in the gallery. Following up on a member request we increase the limited size of the work to 192 square inches (frame included), which allows work of 12” x 16” instead of 12” x 12”. A sold piece can be replaced by another piece of similar size. The “people’s choice”, voted by the public, will receive the annual Janet and Harvey Charnofsky award of $100. We will end the show with a gingerbread and mulled wine party on December 30, 3-4 pm. The winner will be disclosed. Come to the Artisans' Co-op on Saturday 2nd, Labor Day weekend. There will be demonstrations from our Potters, Jewelers, Fiber Artist and Painters. The Gallery will have a sale in celebration of our 21st year. The 2017 Studio Discovery Tour takes place on Labor Day weekend (September 2, 3, & 4) and the weekend before (August 26 - 27) ~ Studios open 10:00 a.m. to 5:00 p.m. each day. This free, self-guided tour along a 25-mile stretch of Highway 1, from Manchester to The Sea Ranch, is the perfect way to spend a leisurely day or an entire weekend. The artists you meet along the way are happy to demonstrate the making of their art and share their unique vision. You can begin your adventure by stopping at the Discovery Gallery, 39140 So. Hwy 1, Gualala, CA, located in the Seacliff Center, lower level, on the west side of Hwy 1, to preview the work of Studio Tour artists and to pick up catalogs with maps. This annual photography exhibit features the works of ten outstanding Sonoma County photographers, and lasts from August 7 through 19. We invite you to a reception on August 7 from 6:30 to 8 pm; refreshments will be offered. Admission to the exhibit and reception are both free! Sponsored by the Rohnert Park-Cotati Library Art Committee and Friends of the Library. The Artisans' Co-op has over 50 local artisans work on display. This event we are showcasing our local photographers Benedicta Jacobs, Sandy Reinhold, Francesca Scalpi and Bo Svensson. The photographers will share with you some of their tips in getting the right photo. Want to know type of equipment you need to shoot birds in flight or ocean seascapes? Demonstrations from noon to 4pm. There will be a free raffle to win prints and photo cards. Several of the gallery artisans' will also have their art on sale celebrating the Fourth of July. Blue oceans, blue skies, blue cars, blue eyes, cornflowers and blueberries, seeing blue. All Blue. From San Francisco, take Hwy 101 North to Petaluma. At Petaluma take the Washington St Exit. Turn left on Washington St. and continue all the way to Bodega Bay (The street name will change several times but will eventually turn into Hwy 1.) Hwy 1 will take you all the way to Bodega Bay! Don't turn off of Hwy 1. We're one mile North of Bodega Bay. Look for our signs. 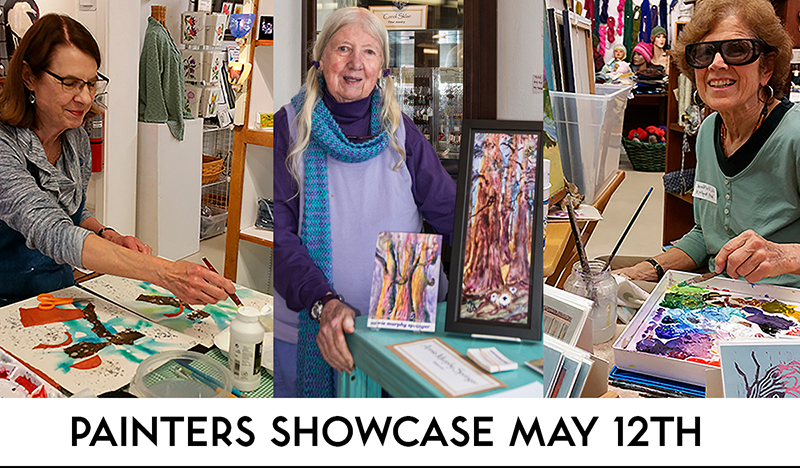 AWS show at Apple Blossom Festival, April 22 (10-6) and 23 (10-5), with an opening reception on Friday, April 21 (7-9 PM). Friday reception is free to the public and Saturday and Sunday are included in the ABF admittance. Show is at the Veterans Building, 282 S. High St., Sebastopol. A repeat of the wildly successful salon style show we had in our former gallery on Depot Street, this exhibition will specifically feature work by artists 60 and over. Creative expression by artists 60 and over Salon Style, Non-juried.